This CD has now been digitally re-mastered! This is not your ordinary CD. Specifically, it is not your ordinary symphonic recording. This is a handpicked orchestra, assembled by Gunther Schuller and comprised of players from the New York Philharmonic, the Metropolitan Opera Orchestra, Orpheus, and other preeminent chamber ensembles and free-lance stalwarts of the New York City scene, recording two giant works of the symphonic repertory. Rarely has such an extraordinary group of musicians been assembled since the 1950’s heyday of classical recording in New York. Why? 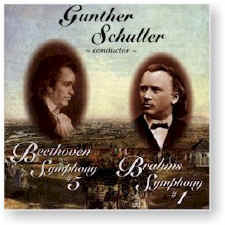 To demonstrate that Beethoven and Brahm’s music is enough, played as written, without having to be ‘helped along’ by the now widely-accepted but far-too-permissive and out-of-hand interpretational approaches of the conductors and performers ... to provide to the public a performance that is completely and utterly faithful to the composers’ scores... and in so doing, to show what a conductor and orchestra with total service and devotion to the art can achieve. Released in conjunction with The Compleat Conductor, Schuller’s new book from Oxford Press, here are perhaps the two great masterpieces of music, presented in performances whose prime interpretational purpose and raison d’être is to pay full, total, unswerving, unqualified, loving respect to their creators’ wonderfully precise and exacting work, with all inspiration coming from and through the music itself. Recorded on (#1-4) 16-17 and (#5-7) 22-23 December 1995 at the Manhattan School of Music in New York City.